I refused to help homeless children, and I’m totally okay with it…..really….maybe. Okay, let me qualify. I do believe in giving back for those rich gifts that have been given to me. I really do. I’m all about paying it forward, sharing my time, talent and treasures – all that good sharing of God’s gifts kind of stuff. Maybe not as much as I should, but I do what I can. But there has to be a limit to saying ‘yes’ to every handout, right? Those kids at the door with chocolate covered almonds, or the skip-a-thon, or whatever. They’re endless! You have to pick and choose carefully, or you’ll go broke and become one of the charities yourself. It’s tough! Guilt is a great motivator, and a lot of charities leverage it perfectly. Send kids. How do you say ‘No’ to a little kid? Add in some tasty treat that you’re craving, and you can’t resist it. You reach into your pocket and hand them $5 bucks for a bland piece of candy you could have bought for $1. So, you’re pressured to help others (guilt), add in some tasty treat (temptation), and sell it through the eyes of a cute, innocent little kid and you’re doomed! It’s the trifecta of sales tactics. You can’t resist it. About the only other thing they could do is be holding a puppy at the time. 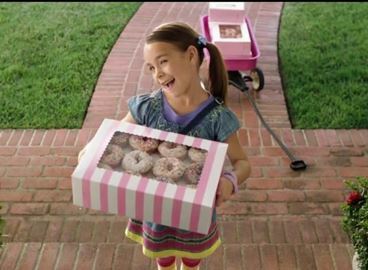 There’s a commercial out right now where a little girl is trying to sell donuts door-to-door. With a syrupy-sweet voice, she stands like Vanna White, showing off the doughy goodness while batting her cute little eyes and says; ‘Donuts?’. The lady manages to resist the temptation, thanks to a low-calorie cereal bar….yeah, like that’ll work in real life. My wife loves this commercial. Not because of the product they’re selling, but she uses the same ‘Donuts?’ voice on me when she wants something or wants me to have a snack with her. Apparently, it’s not bad to sneak a snack if someone else does it with you. “I’ve been standing here all day and no one has bought one”….CRAP! As I ate the stupid chocolate bar on the way home, I wondered if that was one of his lines to make a sale. I may never know, but I gotta say that it was effective. I decided a while ago that I would no longer succumb to the door-to-door pitch whenever possible, mostly because I think it’s a lousy way to get a kid to go on a school trip or pay for a hockey tournament. I also did it because I have to, like most of us, watch my budget. I have a couple of standard lines I use: ‘sorry, I don’t have any cash on me right now’, or my favourite; ‘I have a nut allergy’, while standing recoiled behind the door like some vampire being shown garlic. Usually, I don’t even answer the door any more. How sad is that? What do you do? How do you, standing there with an audience of shoppers silently judging your goodwill, put your foot down and refuse such dastardly trickery? The ethical and social pressure is immense. And no one wants to hear your excuses, either. They just want you to pay up and get your groceries off the belt. I didn’t have a need to say ‘yes’. I should feel no guilt, no shame in deciding that what I do regularly is good enough, so I replied, quietly and with no eye contact, ‘Not today’. So, why do I feel so guilty? I even wrote this blog, trying to clear my conscience. Please tell me that I’m not a bad person for not giving $2 to homeless children. That sounds bad, doesn’t it? This entry was posted in charity, children, chocolate, donuts, giving, guilt, homeless, Humor, kids, religion, temptation and tagged charity, chocolate, giving, guilt, homeless, humor, kids by mid-life crisis. Bookmark the permalink. Thank you. I would have given my $2 to the homeless kids myself, but I didn’t know where they lived…. Ouu… lost a little bit of karma points on that one. I don’t believe in Karma, so it’s okay…fingers crossed! You’re coming shopping with me from now on! This post had me laughing with the whole “As I ate the stupid chocolate bar on the way home, I wondered if that was one of his lines to make a sale” and the standard lines…I always use the “Sorry, I don’t have any cash on me right now”. Although, every now and then I do get guilt tripped into one of them if they catch me off guard. 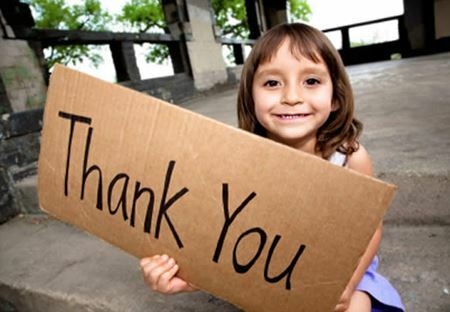 As for the giving $2.00 no need to feel guilty, I go to Walmart a lot and they are always asking if I want to give a buck to whatever children’s thing they are donating for…as much as I shop there if I gave a dollar each time I would be the one needing donations. 🙂 I tell them I already gave last time or say not today, just as you said. I only wish I was joking!! Most charities only donate about 15% – 20% of their intake to the actual people in need…but it’s the constant bombardment that really gets me. Glad you enjoyed it, though…thanks for reading!